You are here: Home / Betfair Tutorials / Can You Really Make Risk Free Profits Trading On Horseraces? Exchange trading, scalping and greening up – are all terms used to describe the process of creating risk free bets using the betting exchanges. In this series of articles we’ll look at the various aspects of trading on horse races. Starting by defining the basics, then as the series progresses we`ll be covering intermediate to more advanced techniques, including the use of betting software. Lots of eyes will immediately light up at the thought of buying low and selling high to make good profits. However, many are put off by currency trading because a large chunk of capital is often required by the broker. And depositing several thousand of one’s hard-earned into the hands of an anonymous someone on the other side of the world, in an industry that seems to have little oversight, is not appealing to those that think. Share trading has its adherents, willing to pay the frequent commissions and deal with all the paperwork. The appeal of sports trading is that anyone can start with only small amounts deposited with an online bookmaker and a betting exchange. Commissions are generally reasonable, and a transaction history arrives with a mouse-click. In this series of articles we will focus on trading horse races. Betting to win (backing) and also betting to lose (laying) the same horse in the race, so as to lock in a guaranteed profit — regardless of whether that horse wins or loses. The aim is always to back high and lay low. You think the price of a favourite trading at 3.50 is going to shorten, so you back it for £50, this is the first step of the trade. However at this point you are simply placing straight bet to win £118.75 or lose £50 depending on the race outcome. Ultimately your money is exposed. To complete the trade you need to place a lay bet at lower odds, offsetting your stake money to guarantee a green screen. 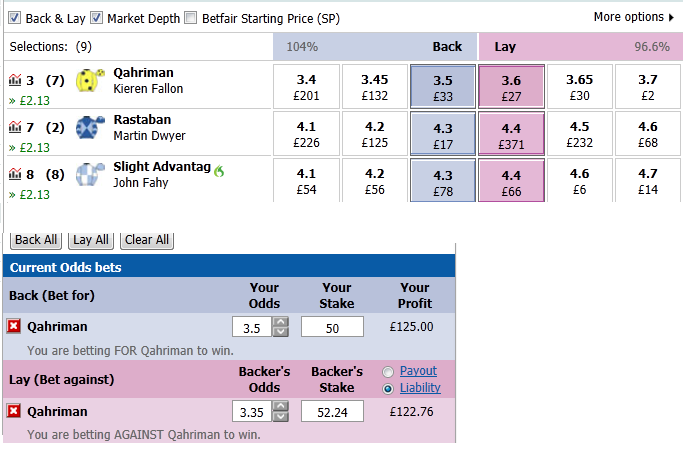 In this example the trade is set to close out at 3.35 for £52.24, which guarantees a profit of £2.13 on every selection. Horse Race Traders (HRTs) have two basic, operating strategies available. 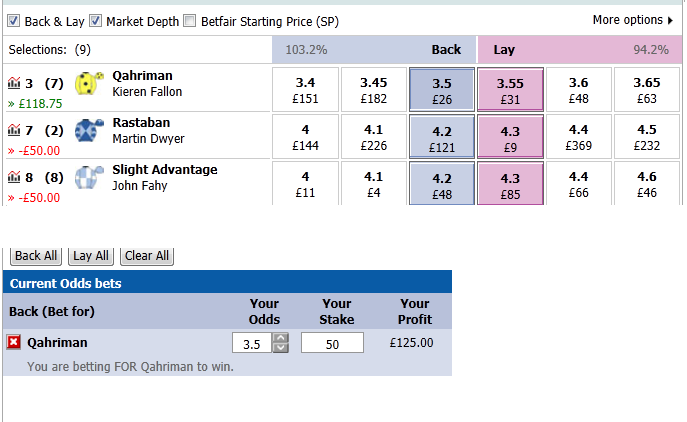 Option1: In the last few minutes before a race begins, they can repeatedly back and lay a horse to exploit to the back/lay price fluctuations. For Option 1, you’ve got to be physically and psychologically suited to the stress of very fast-moving figures, and to your share of losing trades. You won’t win them all! This is because on-the-fly traders work with races that have very high volatility. To exploit the back and lay pieces so as to repeatedly lock-in mini profits there must be big chunks of money coming into the market to drive prices up and down. The profits are in exploiting the fluctuations. Option 2 is far more laid-back and much easier on the nervous system! It gives you time to think, to plan and to enjoy the roses in between bets. You can operate in much less volatile markets. Lightening fast reflexes and exceptional ability to read the racing markets are needed to perform manual tick trading, minutes before the start of a race (Option 1). Therefore this style of trading should only be undertaken by punters with plenty of Experience, even then we strongly recommend using betting software to eliminate errors, and provide you with the fastest bet placement options. We’ll review some of the products available. And cover one or two other relevant topics. Why paper trading doesn’t engage any worthwhile emotional response?